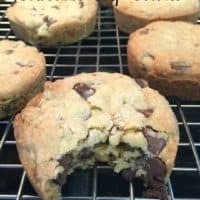 Here are some, deliciously thick and gooey, hockey puck chocolate chip cookies that are soft and full of chocolaty goodness. My brother named them hockey puck chocolate chip cookies because that is the first thing he thought of when he saw these super thick cookies. 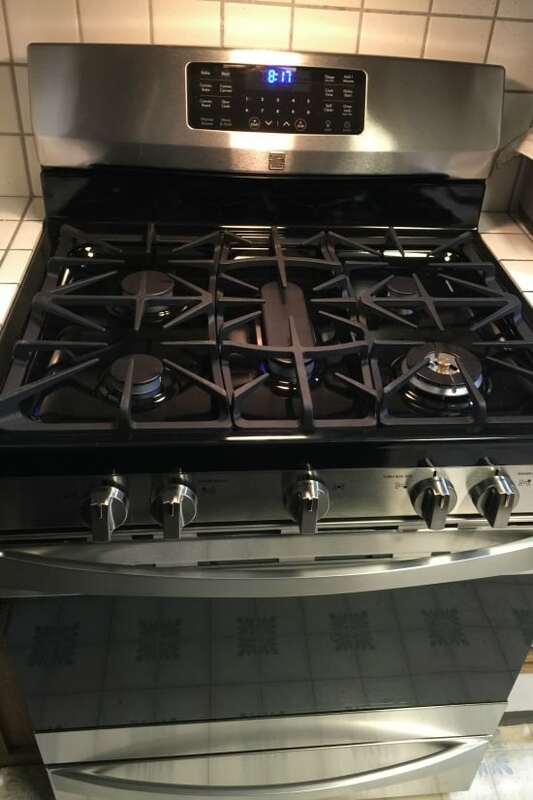 I just got this brand new stove and am sooooo excited! My boyfriend bought me this super fantastic stove and these cookies are the first thing I baked using this awesome oven. I’ve been baking all day and what a difference from my old stove. Can’t even compare. 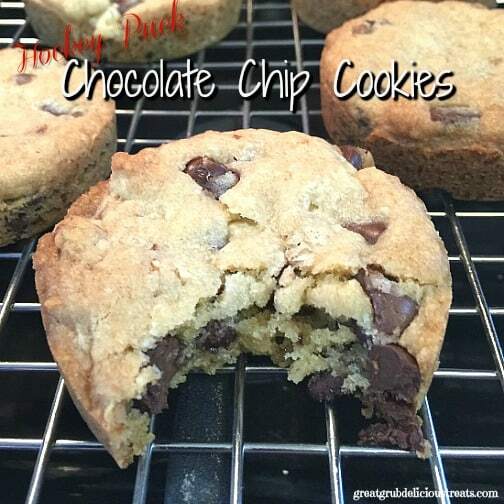 You can make these hockey puck chocolate chip cookies just like I did using Rachael Ray® mini cake pans or, if you do not own these cute little cake pans, you can use a regular muffin pan or cookie sheets. 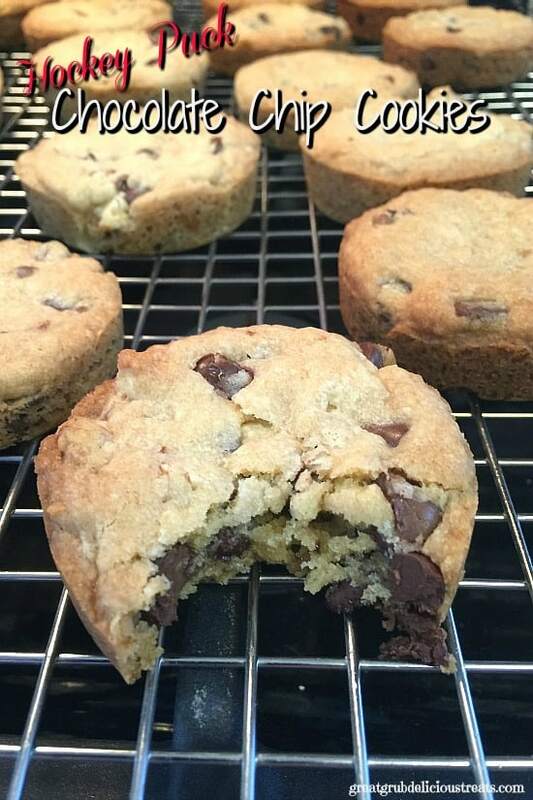 Your cookies will be thick just not like the ones shown here. I LOVE these new pans! 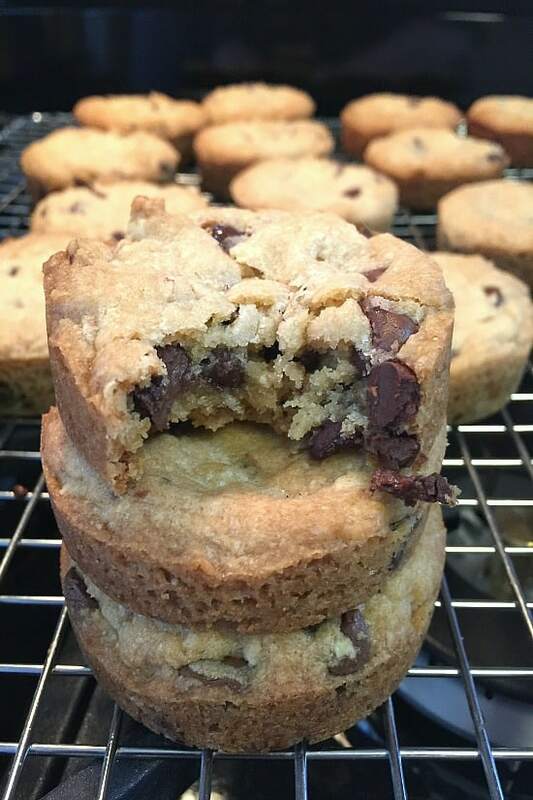 So imagine biting into one of these ‘hot right out of the oven,’ super thick, hockey puck chocolate chip cookies. 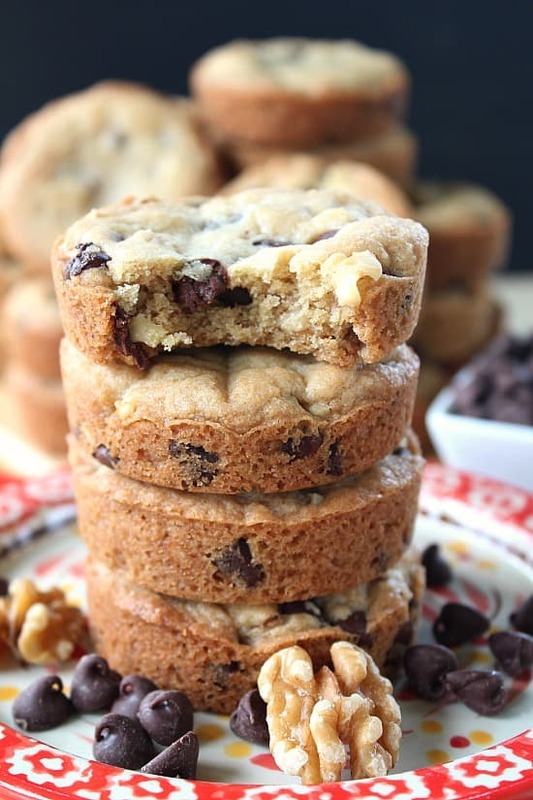 The softness of each cookie, along with all the delicious chocolate chips and the walnuts packed inside each bite, makes these cookies a favorite in our house. 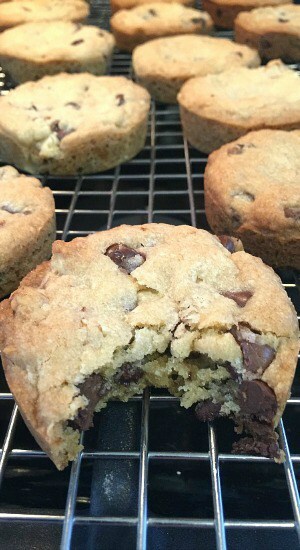 As you can see, these hockey puck chocolate chip cookies are loaded with sweetness, and they are sweet! 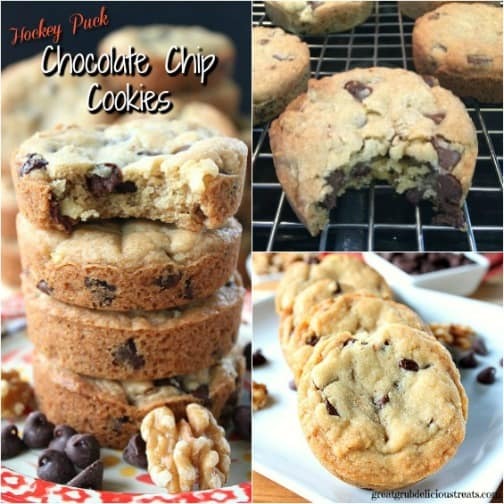 Definitely a great cookie to add to your holiday baking list. These cookies are great to take to those holiday parties, potlucks, and to your next family get together, that I’m sure you all will be going to in the near future. 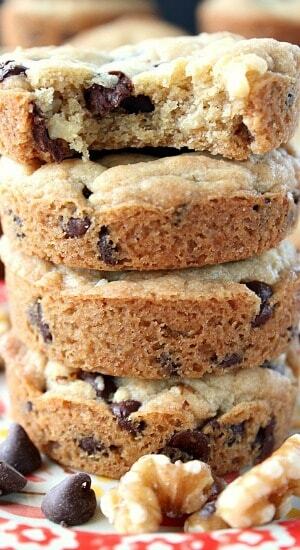 Seriously, these cookies are the BEST chocolate chip cookie I have ever eaten. So thick, so soft, so absolutely delicious! Double the batch because after you taste these delicious little gems you are most likely going to want more. Once these cookies came out of the oven, and I mean right out of the oven, we all had one, then another, then another. Oh my, such a delicious treat! It’s like biting into a little chocolate chip cake. So yummy! I had made these for our Halloween potluck party at work, but I got sick, missed work, and no one got to taste these. I will be making them again soon for all my co-workers to enjoy. 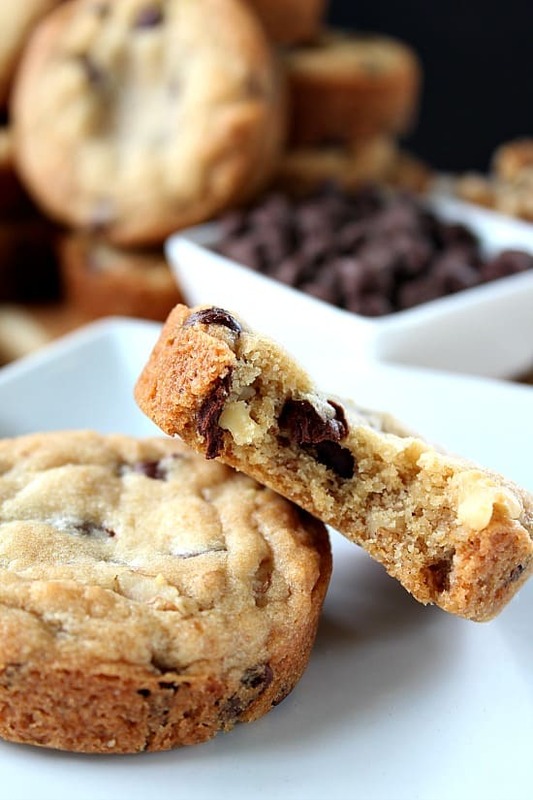 These are the BEST chocolate chip cookies, period! In a medium mixing bowl, whisk flour, baking soda and salt. Set aside. In a large mixing bowl, beat on medium speed, butter, brown sugar, sugar, vanilla and corn syrup together until creamy. Beat eggs into wet mixture, one egg at a time. Gradually add flour a little at a time until all the flour mixture is mixed well. Stir in chocolate chips and walnuts. Spoon into mini cake pans from RachaelRay® until level with pan. Bake for 15-17 minutes or until edges are brown. Remove from oven and let set for a couple minutes, then remove from pan and place on wire rack to cool. I bought these mini cake pans from QVC®. Here are a couple pics that are the perfect size for pinning to your Pinterest boards! Unsalted butter and light corn syrup I assume? 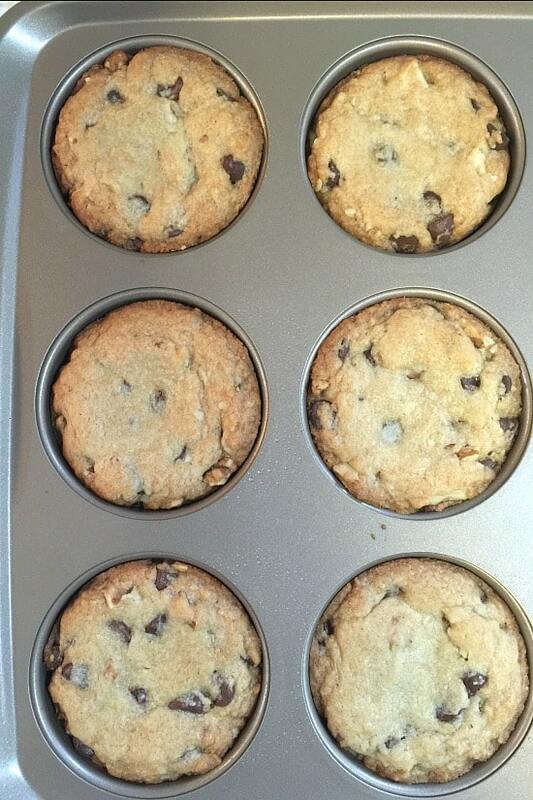 Hi Laura, I just made them in my mini muffin pans and I believe I baked them for 9 minutes. Can you make these in a muffin tin if you don’t have a Rachael Ray mini cake tin? I didn’t see about how many this recipe makes. They look delicious. I know they have plenty of chocolate, but if they are covered with a coating of chocolate they will really look like hockey pucks!